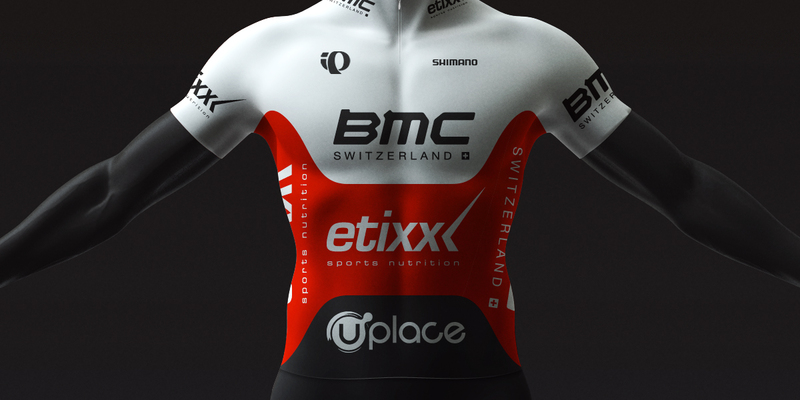 The BMC, Etixx, U-Place Pro Triathlon Team wanted an update of their outfits for the 2016 triathlon season. Since the team acquired a third main sponsor a number of elements needed to be rearranged which resulted in a vigorous update of the existing design. Since the position and sizes of the different sponsor logos are literally bought, designing an outfit such as this one certainly has it’s limitations. Despite that a striking and recognizable design was created using the color pallet of the main sponsor. Next to that; the climate conditions of eg. the Hawaiian Ironman where taken in to account regarding the position of the different color blocks into a geometric layout. Since the wetsuit worn during the first stage of the event is mostly submerged during the competition its commercial value is considerably less compared to the outfits worn during the other two stages. For this reason we only designed the cycling and running outfits.